33 people have viewed this property this week. 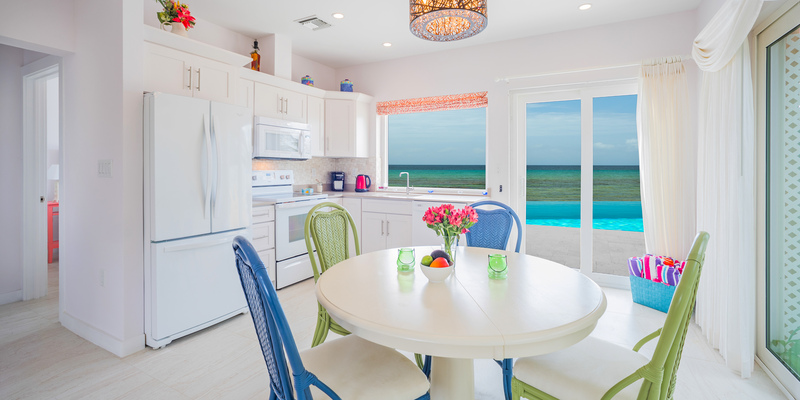 Coral Cottage Pink is one of two charming brand new homes full of Cayman character, nestled together right on the oceanfront in Old Man Bay. 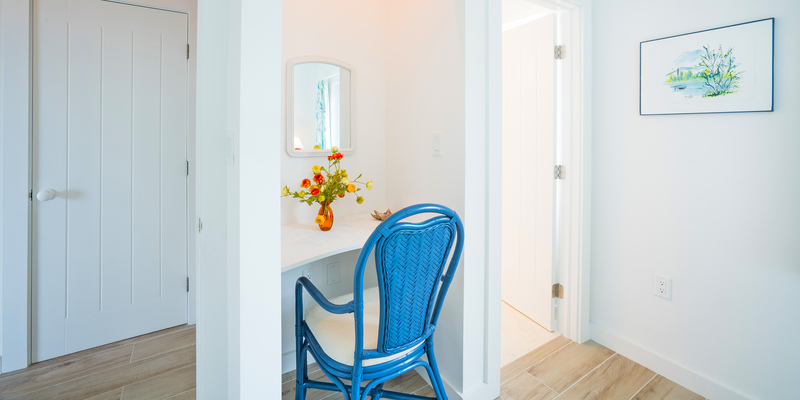 The cottage has a private oceanfront infinity pool and tranquil garden patio perfect for al fresco dining. The vistas across the ocean and into the garden are spectacularly framed, with large picture windows and sliding doors highlighting the surrounding landscape. 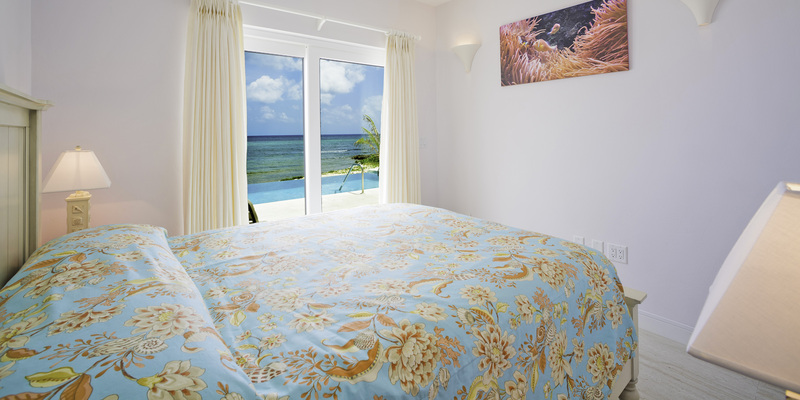 From the cottage, guests can shore dive (SCUBA) out to the reef wall where buoys mark two breathtaking wall dives. Just a couple of flipper strokes away is a splendid snorkeling rock for the less adventurous. On land, tours of the spectacular Crystal Caves and fascinating Davinoff's Concrete Sculpture Garden are just a leisurely stroll away. The cottages provide a wonderful haven within a quiet rural neighborhood with its pool size and convenient location being key attractions. 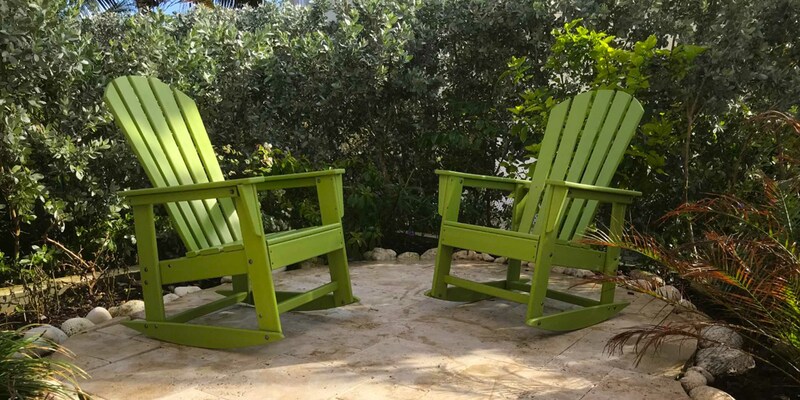 The house extends into the garden patio, an ideal space for island cookouts or to simply enjoy the outdoor elements in comfy rocking chairs. 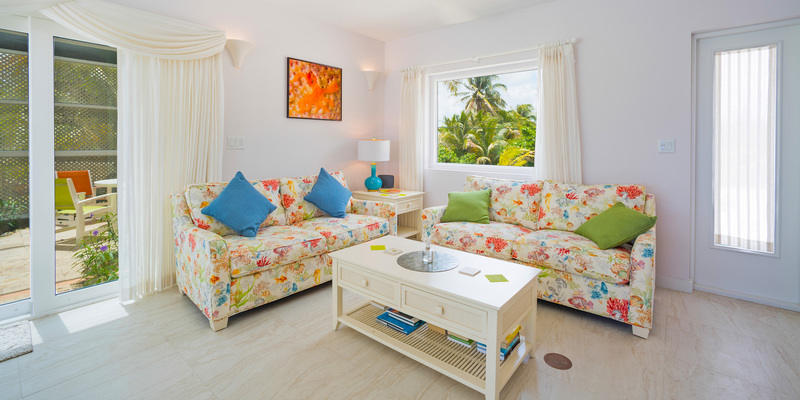 Delightfully decorated interior welcomes you in true island style. Living and kitchen area is flooded with sunlight and opens to the pool and garden patio. Living area furnished with comfortable lounge seating and flat screen TV. Queen suite on the main floor with sliding glass doors to the pool deck. Oceanfront king suite and land-side queen suite on the upper floor. 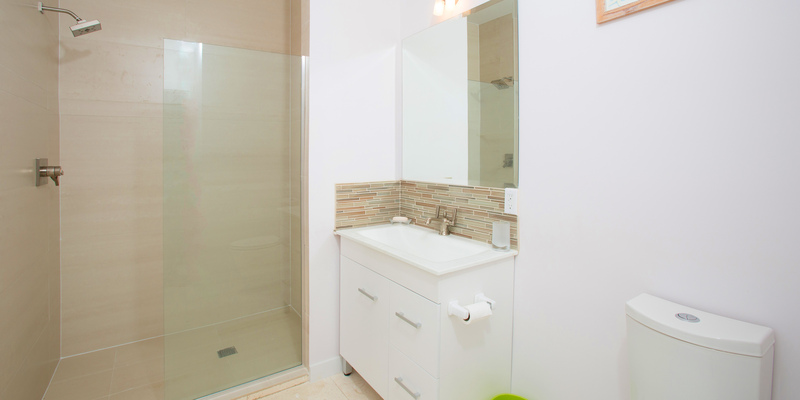 Modern bathroom fixtures, quartz counters, tiled and glass walk-in shower. High-end modern kitchen with granite countertops and stainless appliances. Cookware, dishware, cutlery, and Keurig coffeemakers all provided. Kitchen table expands to seat 6 for family dinners. 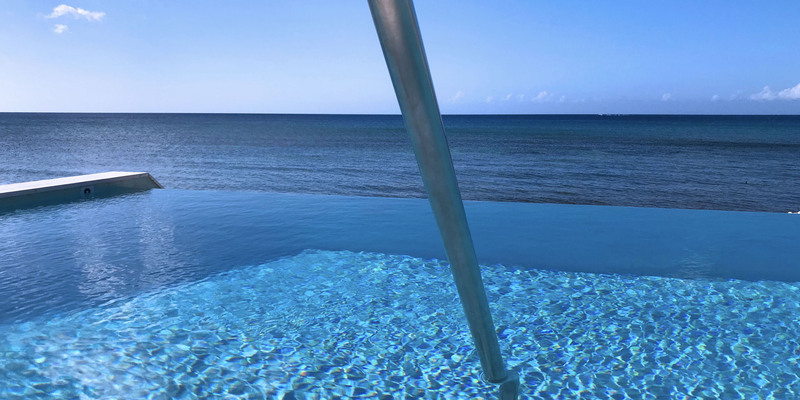 Oceanfront infinity pool to swim or lounge in while soaking in the views! 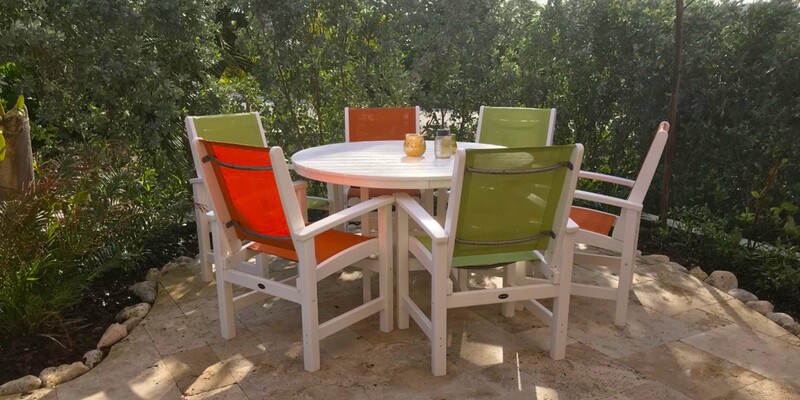 Patio garden for al fresco dining with seating for 6, plus 2 rocking chairs for relaxation. Excellent snorkeling just steps from the back door. Only 10 minutes from two large resorts with water sports, restaurants, bars, grocery, and shopping. Private entrance and separate driveway from sister cottage next door. Take advantage of our discounted rates and rent both cottages! 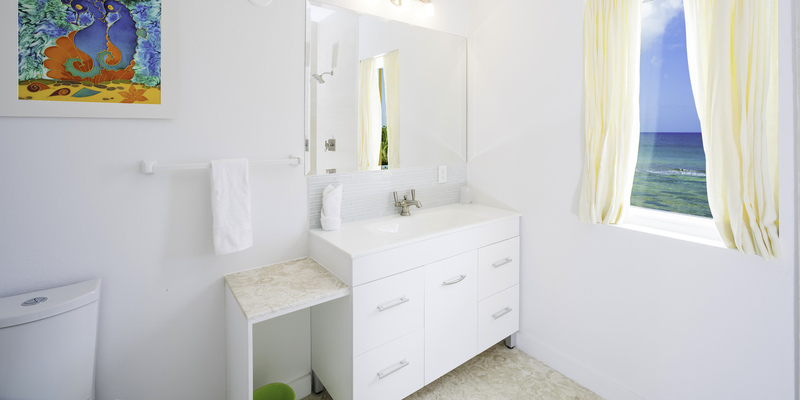 Vacation next door to your friends or family while retaining the privacy of your own home. 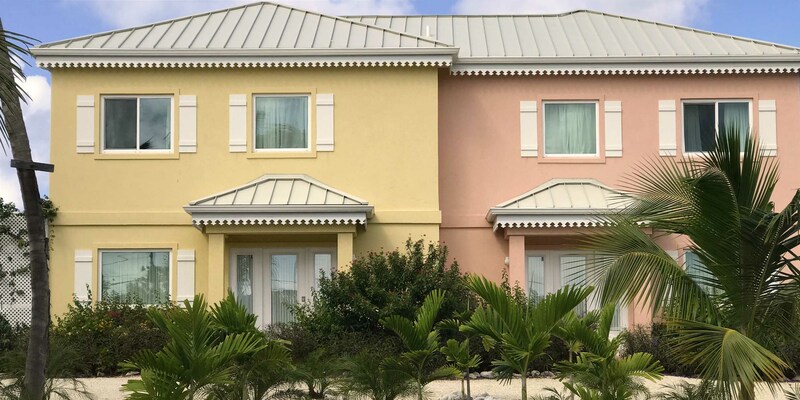 Coral Cottages Pink & Yellow are semi-detatched oceanfront villas that each have their own oceanfront infinity pool and sunny deck in a sandy, palm fringed setting. 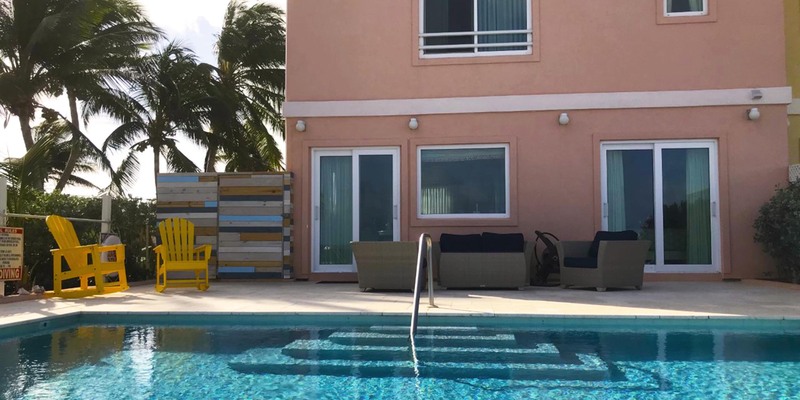 There is a privacy screen between the villas with new landscaping and hedges between the pools. 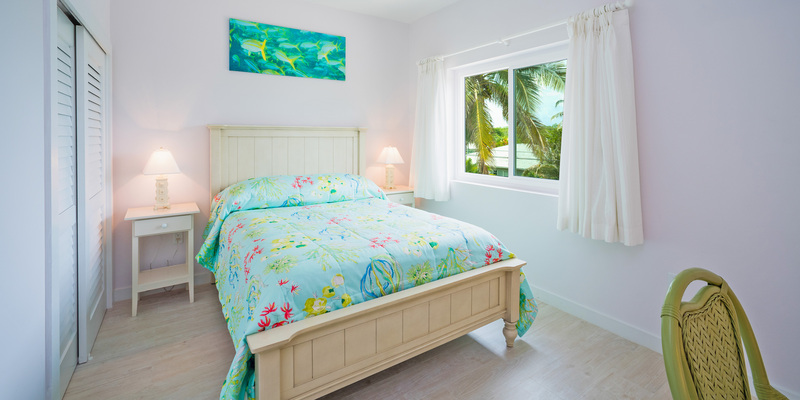 The beach here is rugged, awash with centuries-old exquisite coral fossils, beautiful conch shells and gifts from mother nature as the waves lap the shore. 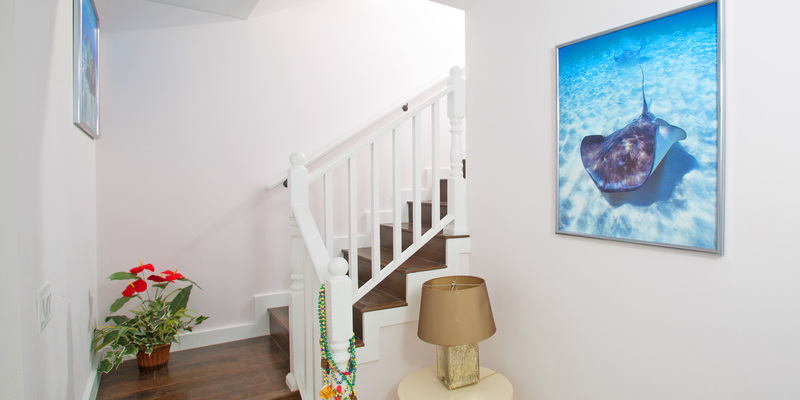 Guests will want to wear pool shoes to walk, or swim fins in the water for foot protection. The water is teeming with life which is simply not present near a sterile sandy beach. You will find all types of sea creatures sheltering in and around the shallow reef close to shore. These conditions make for excellent snorkeling, which is highly recommended—equipment can be obtained at the Silver Thatch welcome centre, if you do not have your own. Please look closely at the photos to see the multi-colored shallows: white/light blue is sandy bottom, browns indicate corals, and darker colors indicate sea grasses or soft corals. Old Man Bay is home to some of the best snorkeling on the entire island. Just about 300 yards east of Coral Cottages is Connally's Cove where local divemasters often come to snorkel. As there are few homes in the area, the marine life here is less skittish and many coral heads provide sanctuary for juvenile fish. Our guests often just put a pool noodle under their arms and float for hours in this area observing the fish in only 3-6 feet of water with little, if any, current. Further out from shore are two famous dive sites on the reef wall, marked by buoys for the more adventurous. 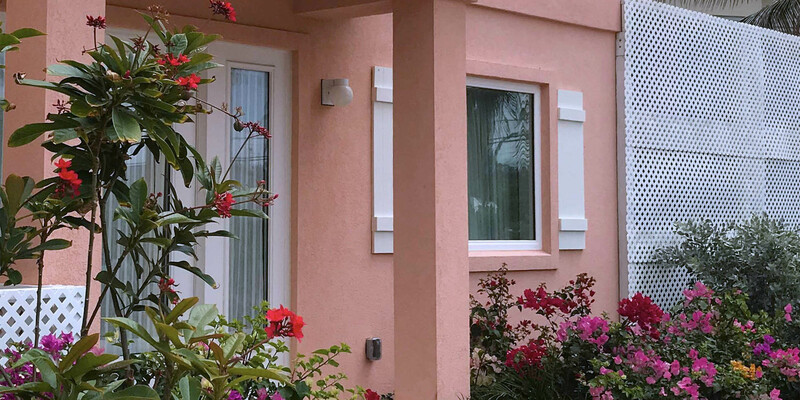 We loved our girl's trip to Coral Cottage Pink!! Cutesy vacation home with a great pool. The beach is rather rocky but if you have water shoes then you're good! We went snorkeling a lot and had a great time out in the water. We loved that the home felt private but was still only a short drive away from bars and restaurants. We really enjoyed staying in this house!! Perfect home for our family. This house is in a greta location to do lots of stuff on the island like Botanical Gardens, Crystal Caves, Blowholes, and delicious restaurants! The North Side was nice and quiet compared to our last trip to Seven Mile Beach. We enjoyed the privacy we had here as well. 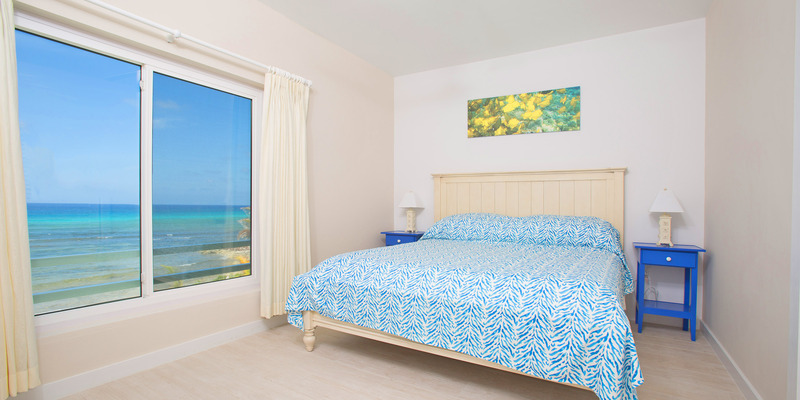 This house has great snorkeling so you'll want to pick snorkel gear up at Silver Thatch!! We also checked out speakers and coolers and had a great time. Also want to recommend Tukka! We loved the atmosphere and food there. You'll love your stay here! Loved staying here!! We rented out both houses and loved it. The interior is cute and feels like a vacation house. The kids loved that they got too pools! The adults in our group liked the screened in patios. Bedrooms were nice and comfy. No one had any complains the entire time which is rare with our kids!! They were busy with all the local things to do and with snorkeling. We had a great vacation to Grand Cayman. We'd even want to stay in this house a second time it was so great!! This house is exactly what we were looking for! Great snorkeling, enough room for all 6 of us, and our own pool! Everyone loved staying here! The kitchen is cute and overlooks the water and makes doing the dishes so much easier. Couch is comfy and perfect for movie nights!! Perfect location for us because we wanted to be in reach of everything. Just ended an 11 day stay at Coral Cottages, Old Mans Bay and had a wonderful time. The location is knockout and makes a perfect getaway. The views from the cottages are outstanding and the snorkeling is fabulous. The cottages are well equipped and have the most delightful beds I've ever slept in - just heaven. 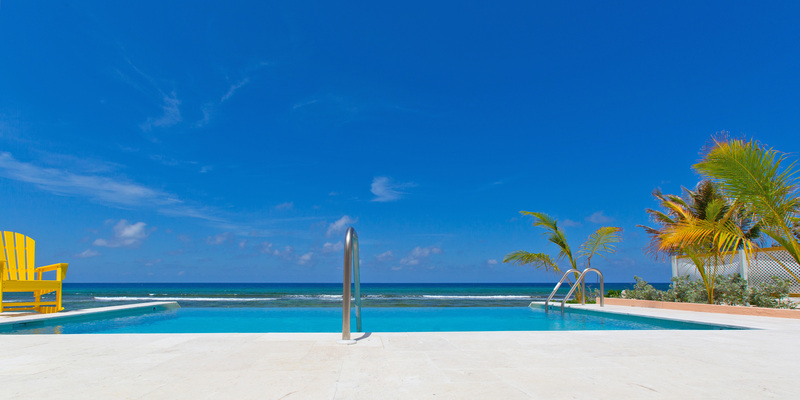 The resorts of Rum Bay, Star Point and Cayman Kai are just 15 minutes drive. The Crystal Caves (a must see) are about 2 minutes away, as well as the Botanical Gardens. There are plenty of places to eat, drink and snorkel, it really couldn't have been better. The North of the island has a wonderful feel - so much better than the more commercial 7 mile beach. 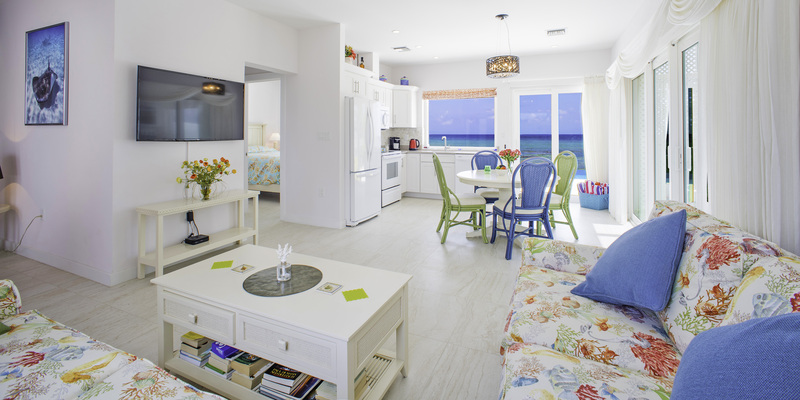 I thoroughly recommend Coral Cottages. Had an amazing time staying here! Comfiest beds, with fabulous views and spacious living area with a lovely outdoor garden. Definitely located in the best part of the island too. Could not recommend it highly enough! It is always nice staying in a new home. Add the fact that it is oceanfront on Grand Cayman with excellent snorkeling! We could not have been happier with our decision to stay for a week! We have 3 children and they were out in the water every day or walking up and down the beach collecting shells and corals. Pool shoes are needed on the beach and while swimming, but we knew that before we booked. The snorkeling was fantastic. The home is also 15 minutes from Rum Point and we enjoyed that beach 3 days while there. Several nice restaurants in the area including Over the Edge, Italian Kitchen and our favorite, Tukka. Botanical gardens are very nice. Try to go early as it gets hot. Crystal Caves were a treat as well. Thank you to the owner for sharing your lovely home with our family. We will be back. 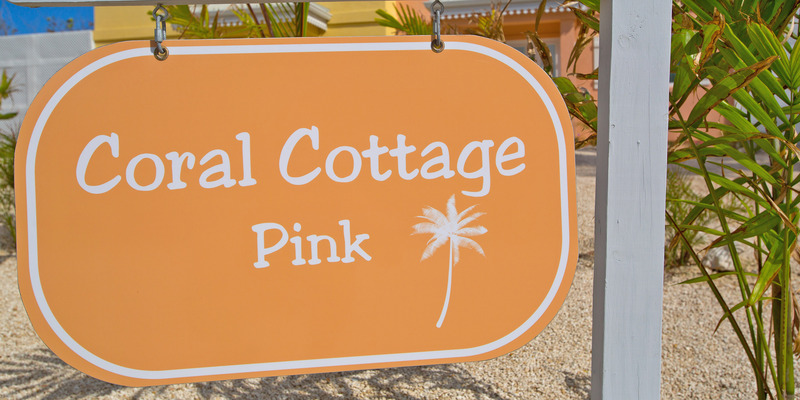 We had a wonderful stay at BOTH Coral Cottage Yellow and Coral Cottage Pink. We were two families travelling together and the duplex was absolutely perfect for our two families.. Lots of room for everyone to gather. Kids played in one pool, adults stayed around the other! Views were stunning and the snorkeling was excellent. 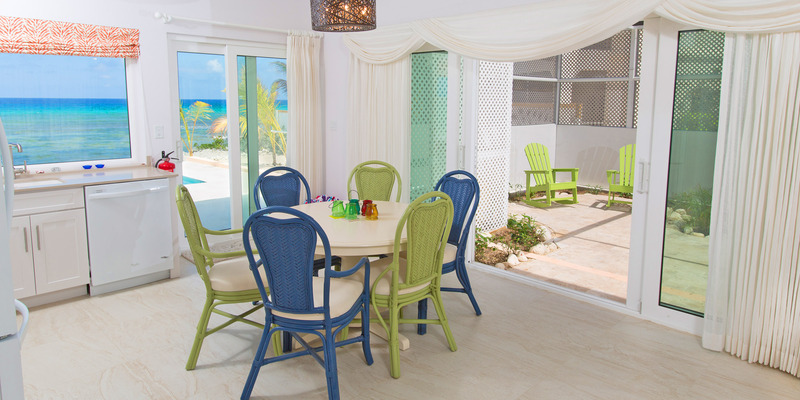 We would recommend Coral Cottages to anyone with a large family and to two families travelling together.